After a huge lunch at the river Café we spent the rest of the day walking around the city and stopping off here and there for some tasty alcoholic beverages and people watching. Until finally it was time to eat again! Hooray!!! Although I had someone visiting I really wanted to go somewhere new. Luckily I had talked about wanting to check out Café Habana earlier in the week and Mr. Pruner remembered. It’s not really just a sandwich place- more like a Cuban Sandwich place! We showed up and noticed a crowd of people outside. I put in my name and was told the wait would be about 20 minutes. We were milling around the idea of walking over to Freeman’s when she came out and said our table was ready! We only waited two minutes! One thing Café Habana doesn’t have much of is space. However living in NYC you learn quickly to cram in beside your neighbor and just enjoy. 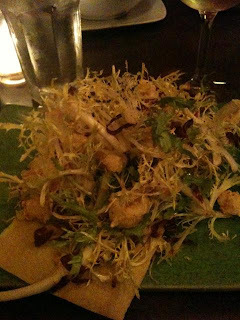 Friday we headed over to DUMBO to celebrate restaurant week at the River Café. The River Café is a gorgeous place right on the water with a stunning view of lower Manhattan. I’d been here a couple of times before but never for their restaurant week and I was excited. We were a little early for our reservation so we stopped off first at Almondine to pick up the best Almond Croissant in the city for Mr. T who was working Then we headed over to Jacque Torres to drool a little as the smell of chocolate slowly enveloped us. Then a last stop to Five Front for a drink in an attempt to cool down from the humid weather. 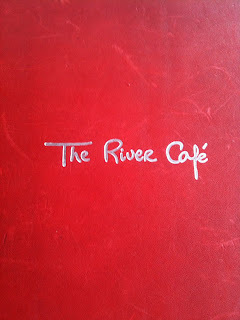 We walked into River Café and got a nice two seater right by the window. I couldn’t help but notice they added another row of seats to the space. I assume they want to pack it in for restaurant week. It made the space a little tight but still quite manageable. We ordered a bottle of Sauvignon Blanc and perused the menu. The Start of the Pitted Prune Weekend- Lombardi's! One of my oldest and dearest friends, the Pitted Pruner, came down for his semi-annual visit this past weekend. I love when Pruner visits because he enjoys doing exactly what I love most- walking around the city and eating lots of food. He flew in on Thursday night and we decided to begin our food weekend at a NYC institution Lombardi's. 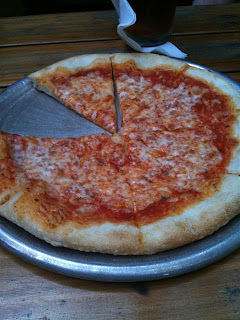 We started out with a large pie- half Pepperoni and half Sweet Sausage. I love Lombardi's pie because it has a slightly sweet sauce, the perfect amount of cheese and the best pepperoni in the city. See how it's curled up at the edges? It's slightly charred and super crispy. Mmmm...Crispy meat products!!! Last time I thought the crust was slightly soggy in the middle so I ordered it extra crispy. This time the dough was perfect with a great foldable middle and wonderful crunchy edge. 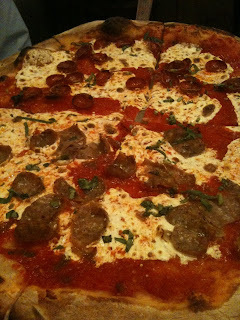 We decided to be a bit more adventurous with our second pie and chose Ricotta Cheese, Meatball and Garlic Spinach. Sunday was out last full day to enjoy Provincetown so after chowing down on those wonderful malasadas we decided that one more meal of fresh lobster was in order. We just happened to be right next door to the Lobster Place enjoying some drinks at a dive bar so I figured why the hell not. I heard the lobster was some of the best in town if you could handle the touristy, family atmosphere. Luckily we got seated upstairs right near the bar so most of the tables around us were people more our age and we had a little bit more space to move around than in the packed dining room. 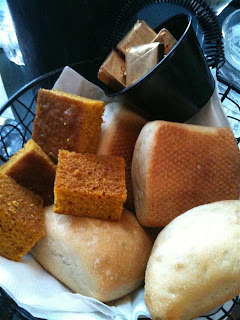 They started us out with a nice bread basket filled with Pumpkin Squares and Some White Rolls. Their soup sounded really good so we ordered the Lobster Bisque and Clam Chowder. Walking around Provincetown on Sunday with the ladies I needed something sweet. I had heard about this Portuguese Bakery in town so we headed over there. As soon as I saw these in the window I knew it would be the perfect fix. Malasada's!!!! 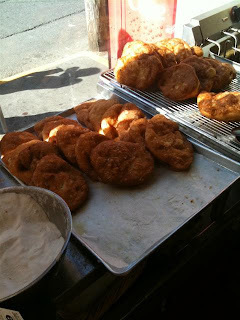 OMG Imagine some fried dough from the fairs when you were little and make it taste about 10 times better. Look at how huge this thing is!!! The Malasada was piping hot and had the perfect ratio of crunchy outside crust and doughy warm innards all lightly dusted with cinnamon and sugar. Can you say YUM!!!! It literally melted in my mouth! I have been dreaming about this pastry ever since that day. Apparently they sell these stuffed with custard as well. Thanks God my thighs didn't see those! I probably would have bought 10. I must find a place like this in the city. Anyone know a place? I got together with my three favorite people in the world this past weekend for a fun girls vacation in Provincetown. Our first night out in the town we decided to head to a nearby place called Pepe's for some food and drink. Pepe's is located right on the water so we were seated with a nice table overlooking the ocean.We started off with an appetizer of Conch Fritters. 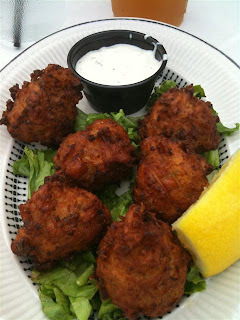 I have yet to find Conch Fritters anywhere near as good as the ones I've had in Key West and these ones didn't quite live up to that standard either but they were still tasty. The outside was perfectly fried golden brown but the inside meat was a little bit tough. I would have enjoyed something a bit lighter but they were still pretty tasty. For my main I ordered the Lobster Salad. This was perfect. The lobster meat was tender and held together by just a smattering of mayo. My friend got the same salad made with Crabmeat. I had a fun filled weekend out in Provincetown with my girls and came home exhausted last night. I decided I needed another day to recuperate so I took Tuesday off and relaxed. Being that it's restaurant week I figured, what's more relaxing than a nice lunch by myself? So I went out! I was planning to check out Union Square Cafe but when I went inside the entire bar was full. I didn't want to sit at a table as a solo diner so I walked over to Gotham Bar and Grill instead. Gotham was completed reserved as well but there were a couple seats at the bar. I placed my order and took a moment to enjoy the atmosphere. This was my first time in Gotham and I have to say the room is beautiful. The main dining area is somewhat sunken with a large window in the back and front of the restaurant that allows some natural sunlight to stream in. Being that it was restaurant week I ordered three courses. 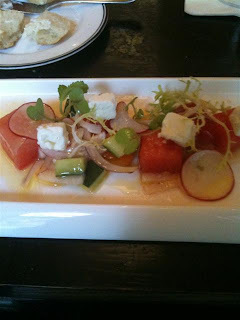 First up my appetizer the Watermelon and Tomato Salad. I was working in my Manhattan office on Friday which is right outside the Meatpacking district. I love working here because it gives me the opportunity to walk over the Chelsea Market and peruse all the delicious offerings it houses during lunch time and possibly see some sort of Food Network star. Not that it usually happens. So far Paula Dean was the only one I ever saw there and she kind of looked like a robot so I got a little freaked out. Not the best experience. Anyway Friday I wandered around sampling Fat Witch Brownies and Cookies at Ruthy’s until I finally found myself in the Lobster Place. Apparently they renovated since the last time I was here and it looked quite different. There is a ton of more space up front and now they have a small stand in the back for ordering prepared foods. I went to the “Shack-in-the-Back” and checked out the menu. I really wanted the Lobster Roll but I couldn’t see spending $16 on lunch (although $16 is quite reasonable for a lobster roll). I was trying the chase the late day sun Friday night and really wanted to catch some rays and have a few drinks. We decided to head over to the east side near Sty Town and check out a few neighborhood places we haven’t been to in a while. As we walked around I couldn’t believe how different that area felt. It used to be filled with lots of families but now it seemed to be all young professionals. I wonder if that has anything to do with the selling of Sty Town? We passed Petite Abeille and realized they had a bunch of tables outside so we sidled up and got ready for some tasty beers. Petite Abeille is a cute Mussels and Frites place that has quite an impressive list of Belgium Beers. 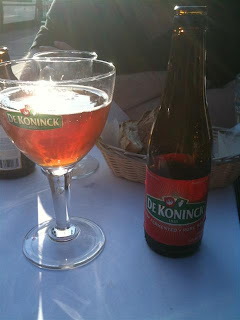 My first beer of the night was a De Koninck. I was not in a cooking mood the other night and was craving something greasy and satisfying. 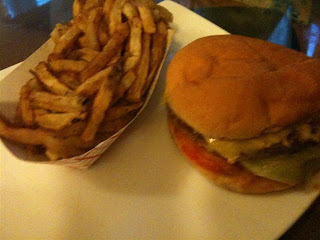 What’s more greasy and satisfying than a burger and fries? It’s the ultimate comfort food in my book. I jumped on Seamlessweb to see what was in my delivery zone and the first one that caught my eye was Blue 9 burger. So I placed my order and 20 minutes later my food arrived. I really love getting food delivered. It’s awesome how with just a few clicks of your mouse you can get a piping hot meal in minutes. You don’t even have to speak to anyone any more! It’s crazy! After meeting some friends out to celebrate with a couple birthday drinks at Spuyten Duyvil Mr. T and I hopped off the L train on 3rd avenue absolutely starving. We were only about 10 blocks away from our apartment but I had no intentions of going home to cook. I needed food stat. 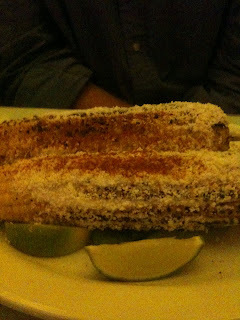 One of the first places we ran across was the little asian tapas joint Chino’s. 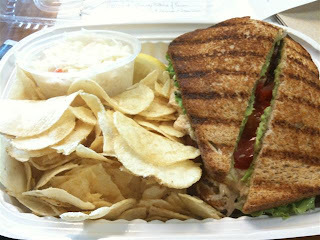 We used to frequent Chino’s quite a bit when they had a great lunch deal and really enjoyed the food, so we stopped in. As I was perusing the menu I realized they had changed it quite a bit from the last time. Nothing really sounded that appealing to me and I ended up ordering the Calamari Salad because it was one of the few entrees left that I used to enjoy at lunch. About 3 minutes later the waiter came back with our dishes. Now I was starving so quick food is great but how can someone put together quality dishes in that short amount of time? Well they can’t- that’s the answer. I have had a serious craving for cupcakes lately- Red Velvet in particular. 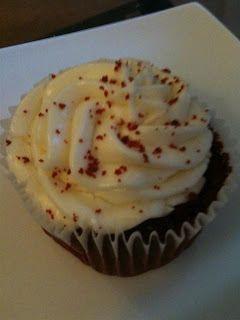 I was so excited on Friday when I ran across the new cupcake truck and got one of their mini red velvets. Unfortunately it was quite dry and not very tasty. So today I decided to try and find has that would satisfy my craving. I stopped by Sunburst Espresso bar for a coffee and saw that they had these delicious looking cupcakes right up front and they were only $2.75. Score! I took one home and dug in. If your a frosting person this cake is for you. The frosting really outweighed the cake. I mean look at that cake to frosting ratio. At first I liked this cupcake. The cake was very moist and the frosting had a slightly sour flavor. However after a couple bites this just became way too much. The frosting was so sweet it became almost sickening and I started to get a stomach ache almost immediately. Mr. T split this with me and if he hadn't there would be now way for me to finish it. It was simply too much. When you live in the city, you get used to paying a lot of money every time you step out the door. Oh sure- there’s some free stuff. The rotating sample at the tasting counter of Trader Joe's, the jam sticks and apple slices at the Green Market, the bread samples at Dean and Deluca, etc. But those things won’t fill you up. That’s not sustenance! This is what you get free every single time you buy a beer at Crocodile Lounge. We’ve been coming to this place ever since they opened their Manhattan location years ago and I have to say it just keeps getting better. -and a great selection of games in the back from Skee Ball to Buck Hunter. Okay I’ll admit the pizza isn’t the best- the crust it too dry and the base has no taste- but the cheese and sauce are pretty good. Once you load that baby up with some oregano, garlic and parmesan cheese…it’s quite a tasty treat! I was walking around in Sheepshead Bay the other afternoon looking for something tasty to have with my sad excuse for a lunch. I had decided to pack some ham and cheese that morning in a rush and the idea of eating only a couple slabs of ham was depressing. I decided to do what I always do when I’m here for work and pick up some Russian chocolates. They always have such pretty wrapping. I love getting chocolates here because I never know what will be inside since I can’t read Russian. This was looking a little bit sketchy at first. But then I opened it up and what flowed out was absolutely scrumptious!!! See all that milk chocolate goodness surrounded by a crispy rice coating. And look at the inside- an almond!! It was a like a Roche but better! Yum!! 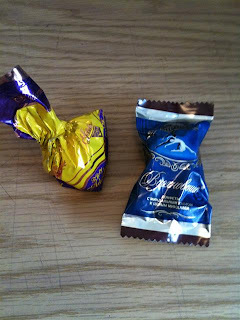 The second candy unfortunately wasn’t very good. It actually tasted like pure vodka inside so I threw it out right away. It’s never a good idea to smell like vodka at work! Mr. T and I spent our day off Friday watching some baseball and bumming around the East Village a bit. I was surprised how many new places have opened up on Avenue A. So many new bars! With great drink deals. We tried out a new one place next door to Drop Off Service and enjoyed some $3 Radeberger’s and then went to an old favorite Boxcar Lounge for their two for one deal. We decided to grab some food around that area before we headed home so we walked over to Back Forty to see if there was a wait. Luckily a spot had just opened up in the back so we were seated right away outside in the backyard. The backyard had about six or seven large tables and reminded me of the backyard of Alchemy out in Park Slope. 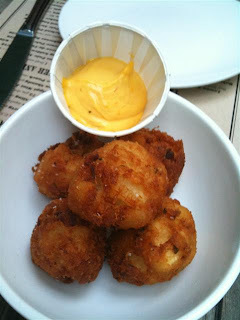 We decided to start by splitting the Salt Cod Hush Puppies. When we ordered these the waitress said they were out of the hush puppies but had the fritters…I’m not sure what the difference between fritters and hush puppies really is so we thought that was a little odd but whatever. I hope everyone did something a little festive this year. 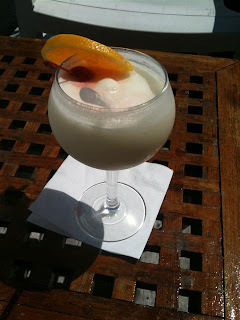 I took myself out for a drink at the Crow's Nest which is located on the rooftop of the Water Club. I decided to go all out and order the Banana Pina Colada. This drink was so delicious!! It was worth every empty calorie it contained and more. It was such a nice day to sit otsde and look at the water. I felt like I was on vacation and it was only 20 minute walk from my apartment! God I love NYC. Happy 4th! Sorry for the long delays in posting lately. My life this past year has seemed like a never ending blur of things to do at all times. The past two weekends we have been traveling and spending way too much time in airports. However the Jetblue’s new terminal rocks! See this computer screen? 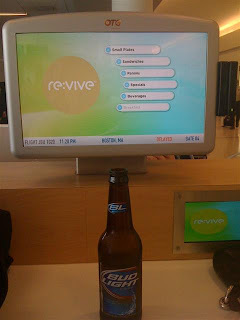 I ordered that Bud Light right from that screen and someone delivered it to my gate. It made my vacation to awesome grilled Grouper in Florida that much better!